Lately, we have been on the hunt for a good local Chinese food restaurant. One of the things we’ve missed over the last few years since leaving California is good Chinese food. We especially miss going to Fat’s Asian Bistro in Folsom. I was first introduced to Frank Fat’s at their L street location that has been there since 1939. Before I met Steve, I worked right across the street and we often went there after work for drinks and share an appetizer (back then it was called a pu pu platter). My favorite dish from Fat’s is their Honey Walnut Prawns dish. Someday, I will actually try to make it. A couple weekends ago we tried Wild Garlic Chinese Restaurant in Renton. It was our second attempt at trying a restaurant here (our first one was good but I wouldn’t order from them again). Wild Garlic was pretty decent as far as Chinese food goes. We tried their Honey Walnut Prawns and it was tasty (not quite as good as Fat’s). My favorite dish we tried from them was their Mongolian Beef. It had just the right amount of sweetness without being overly sweet and just a hint of heat (I did not eat the red devil peppers – probably what saved me). 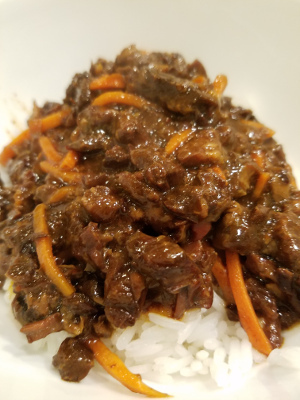 I found a few different Mongolian Beef Recipes on Pinterest so decided to give one a try. It is definitely one I would do again, however I would make sure it doesn’t stay in the slow cooker nearly as long as it was. I made it on Back to School night and we didn’t get home until 8:30 pm, by then it had been in the slow cooker nearly 12 hours (a little overdone). Slice the meat in to thin strips. Add the meat to a bowl. Toss with the corn starch. Mix the remaining ingredients in the slow cooker. Cover and cook 6-8 hours on low. I used thin sliced steak and it worked very well! I put the carrots in when I was just about ready to serve the meal so they would not get mushy. I used boil in a bag rice. This entry was posted in Asian, beef, Slow Cooker.